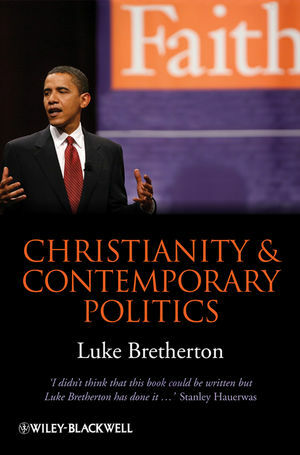 Congratulations to Luke Bretherton on winning the 2013 Michael Ramsey Prize for Theological Writing for Christianity and Contemporary Politics! Relations between religious and political spheres continue to stir passionate debates on both sides of the Atlantic. Through a combination of theological reflection and empirical case studies, Bretherton succeeds in offering timely and invaluable insights into these crucial issues facing 21st century societies. Luke Bretherton is Senior Lecturer in Theology and Politics, and Convener of the Faith and Public Policy Forum at King’s College London. He has worked with a variety of faith-based NGOs, missions, and churches in several national and international contexts. He is the author of Hospitality as Holiness: Christian Witness Amid Moral Diversity (2006) and Reviews Editor for the journal Political Theology. The Terms and Conditions of Political Life. Theological Politics and the Ecclesial-Turn. Summary of Aims and Methodology. 1. Faith-Based Organizations and the Emerging Shape of Church–State Relations. "Working Together": The Shaping of Relations between the State and Religious Groups in a Multi-Faith Society. Social Cohesion, Social Capital, and the "Salvation" of Civil Society. Liberalism and the Continuing Requirements of Public Reason. Theological Politics and the Question of What Constitutes Faithful Witness. Ecclesiology and the Political Mission of the Church. 2. Local: Augustine, Alinsky, and the Politics of the Common Good. The Alinsky Approach: The Work of Broad-Based Community Organizing. Eschatology, Politics, and the Mutual Ground of the Saeculum. Politics without Piety Is Pitiless; Piety without Politics Is Pitiful. 3. National: Christian Cosmopolitanism, Refugees, and the Politics of Proximity. Theological Politics and the Liberal Democratic Response to Refugees. Bare Life and the Limits of Humanitarianism. Hallowing Bare Life: A Doxological Response. Sanctuary: The Practice of Hallowing Bare Life. 4. Global: Consumerism, Fair Trade, and the Politics of Ordinary Time. Consumerism and the Formation of Desire. Political Consumerism as Apprenticeship in the Virtues. Political Consumerism as Neighbor Love. Fair Trade, Globalization and the Emergence of Political Consumerism. Ordinary Politics and the Peace of Babylon. Conclusion: Toward a Politics of Hospitality and a Theology of Politics.